…These exclamation marks are a visual representation of what is happening inside my head when I think of this venison omelette and how freaking delicious it is. I know what you might be thinking. Apples… in an omelette? And with sausages…? Listen up, friends. Apples and sausages go together like two peas in a pod. Like peanut butter and jelly. Like Bella and Edward. It might seem a bit peculiar at first, but give it a chance and you’ll realise it’s absolutely meant to be. The simultaneously sweet yet tart flavour of the apples paired with the smoky, herby venison is a delicious match made in heaven. Now that we’ve cleared that up, can we talk about these venison sausages? Because I can’t get enough. THEY TASTE SO GOOD. If you’re a meat eater and you’re stuck in a rut with your current meat repertoire, I seriously recommend these. I’d describe their taste as a cross between lamb and game- really unusual; but the good kind. And great with not only a variety of vegetables, but fruits, too! I mostly like to pair them with what I’d call ‘cosy’ fruits and vegetables- things like butternut squash, parsnips, sweet potatoes, brussels sprouts, apples, apricots and plums to name a few. Oh, and just when you thought venison couldn’t possibly get any better? It’s also a lean meat, which means it’s super low in fat! SCORE. I remember the first time I ever tried venison. I was living in Australia, and instead of sausages, I had it as a burger. In Brisbane, they have these free to use outdoor barbecues scattered throughout parks and along beachfronts. You just bring your food, and cook it up right there. It’s the coolest thing. Before heading over, my friends and I would stop off at the local supermarket and buy whichever meats we wanted that time. Prior to moving to Australia, I was really pretty unadventurous when it came to food, so when my friend put venison burgers in the basket I was pretty dubious. But they were so good that they quickly became my go to BBQ item! Soooo… what do we actually have here? What is this venison, butternut squash and apple omelette I speak of? Well first up, the apple, butternut squash and venison sausages are panfried together with some herbs. A generous handful of spinach is added in near the end, just as everything is beginning to finish cooking. Then, the eggs are poured over the top, the pan is placed back over the heat for a couple of minutes, and the whole thing is finished up with a cheeky few minutes under the grill. I made this one using three large egg whites. Egg whites are high in protein with trace amounts of fat, so I love using them for omelettes to balance out the fat found in the meat I may use alongside them. However, feel completely free to use a mixture of whole eggs and egg whites if you’d prefer! What’s your favourite way to eat an omelette? 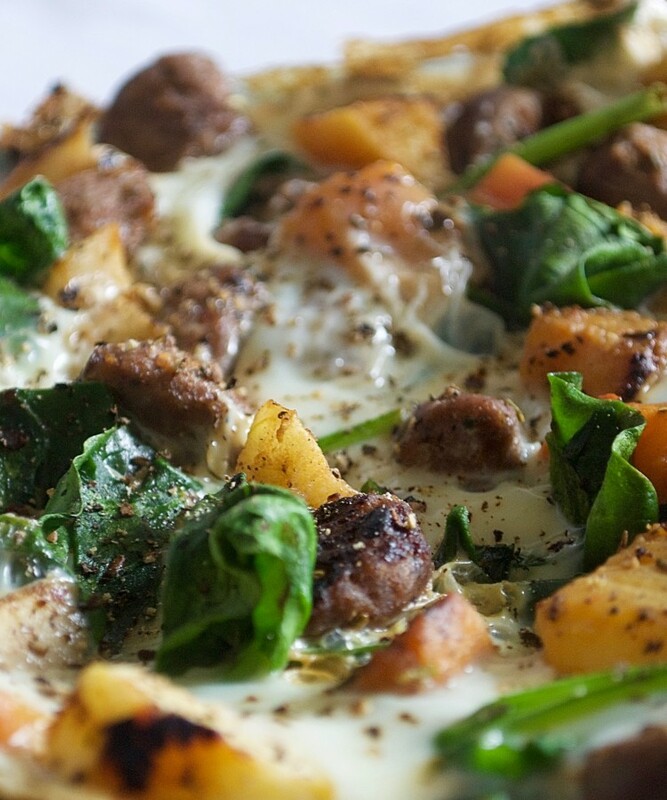 A super filling, healthy and high protein omelette made with apples, butternut squash and venison sausages. Delicious! Preheat the grill to 180 degrees celsius. Heat the coconut oil in a pan over a medium-high heat. Once melted, distribute across the pan and add in the sausages, butternut squash, apple, all the herbs and a sprinkle of cracked black peppercorns. Fry, turning regularly, for roughly 6-8 minutes or until the sausages are cooked through and the apple and butternut squash have softened and browned. 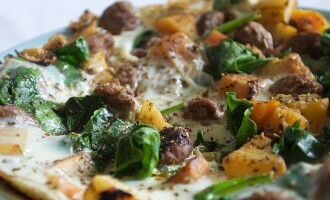 Just as everything is almost finished cooking, add your spinach into the pan. Mix through with the other ingredients until it has wilted. Next, shake the pan so that the ingredients are evenly distributed across it, then carefully pour over the egg whites. Continue to cook for another few minutes- once the sides are starting to crisp but the eggs are still runny in the middle, pop the pan under the grill for 2-3 minutes until the mixture has set. Serve with some more cracked black peppercorns and a dollop of sweet chilli jam. DISCLAIMER: All macronutrient totals are accurately calculated based on the specific products I used. These totals may vary slightly depending on what brand supplier you use in the case of packaged goods. Therefore, all macronutrients given here are provided as a guideline only.